Anthony Darelle "Booger” McFarland (born December 18, 1977) is a former American football defensive tackle. He played college football at Louisiana State University and was drafted by the Tampa Bay Buccaneers in the first round of the 1999 NFL Draft. McFarland also played for the Indianapolis Colts, and won two Super Bowl rings in his career: one with the Buccaneers (Super Bowl XXXVII) and another with the Colts (Super Bowl XLI). He is currently a sideline analyst and consultant for Monday Night Football. McFarland played for the LSU Tigers football team from 1995 to 1998. In his freshman year, he started every game at defensive tackle, finishing the season with 73 tackles (including 12 tackles for loss and 2 quarterback sacks) and quickly became a crowd favorite for pulling double-duty at the fullback position for short-yardage plays. He also recorded a tackle in LSU's victory over Michigan State at the 1995 Independence Bowl. For the rest of his collegiate career from his sophomore year onward, he focused on defensive tackle, and helped bring the Tigers to two further bowl wins in the 1996 Peach Bowl and the 1997 Independence Bowl, also earning 1996 Peach Bowl SEC Defensive MVP honors. Despite a spectacular collapse by the Tigers in the 1998 season, McFarland was named defensive co-captain his senior year, earned first-team All-SEC and All-America honors, and played in the 1999 Senior Bowl. McFarland was selected by the Tampa Bay Buccaneers with the 15th overall pick in the 1999 NFL Draft. In eight seasons with the team, he totaled 305 tackles and 20 sacks over 84 games, and won Super Bowl XXXVII in 2002. On October 17, 2006, McFarland was traded to the Indianapolis Colts for a second-round pick in the 2007 NFL Draft. The trade reunited him with Tony Dungy, his head coach in Tampa Bay during his first three seasons. At the time of the trade, the Colts ranked last in the league in run defense, allowing over 116 yards per-game, and had lost defensive tackle Corey Simon to a season-ending injury the week before. McFarland made his first sack as a member of the Colts against the Buffalo Bills on November 10. He finished the regular season with 33 tackles and 2.5 sacks, although the Colts finished last in rush defense. In the playoffs, the Colts defense became stifling, limiting the Kansas City Chiefs to 44 rushing yards, the Baltimore Ravens to 83 and the New England Patriots to 93. In Super Bowl XLI, in which McFarland had a sack, the Colts defeated the Chicago Bears, 29–17, resulting in the second Super Bowl ring of McFarland's career. He suffered a career-ending knee injury the following training camp. McFarland co-hosted a radio show with Marc Ryan that broadcast throughout the Tampa Bay area on CBS radio station 98.7 The Fan but was canceled when the station dropped its sports format in December 2014. He joined the SEC Network in 2014 as a football analyst. McFarland was also a part-time guest analyst on ESPN's Mike & Mike morning program. McFarland is currently a sideline analyst and consultant for ESPN's Monday Night Football telecasts, after arriving with Jason Witten in 2018. During the Monday Night Football broadcast, McFarland announces from atop a crane-like contraption nicknamed the "Booger Mobile". After receiving criticism for blocking the view of fans seated near the field, the contraption was modified to be less obstructive. McFarland is married to Tammie McFarland, whose cousin is the wife of former LSU teammate Anthony Skinner. They have two children. ^ "Anthony McFarland NFL Football Statistics". Pro-Football-Reference.com. Sports Reference LLC. Retrieved April 22, 2016. ^ "Where did 'Booger' come from?". www.secsports.com. Retrieved May 7, 2018. ^ "Anthony McFarland Bio". LSUsports.net. Retrieved January 26, 2019. ^ "Contact Support". nflcombineresults.com. Retrieved January 26, 2019. ^ "Colts acquire Bucs' McFarland for second-round pick". ESPN.com. October 17, 2006. Retrieved January 26, 2019. ^ "Remembering former Colts player Booger McFarland, who announced game on 'Monday Night Football'". Indianapolis Star. Retrieved January 26, 2019. ^ "98.7 The Fan/Tampa Drops Sports, Stunting Until New Format Debut January 5th". All Access Music Group. December 4, 2014. Retrieved January 9, 2017. ^ ESPN defends obstructing NFL views with 'Booger mobile'. Yahoo Sports. October 23, 2018. Retrieved November 12, 2018. ^ Curtis, Charles. Booger McFarland's crane is ruining 'Monday Night Football' for some fans. USA Today. October 23, 2018. Retrieved November 12, 2018. ^ Florio, Mike. ESPN makes revisions to Booger mobile. Pro Football Talk. October 30, 2017. Retrieved November 12, 2018. ^ The Times-Picayune, NOLA.com (December 2013). "Former LSU Tiger Booger McFarland tackles Tampa air waves as sports talk-show host". NOLA.com. Retrieved January 26, 2019. 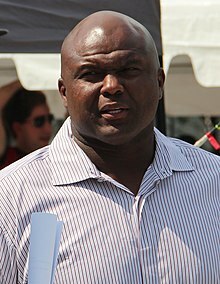 Wikimedia Commons has media related to Booger McFarland.